Think of the mountains of western North Carolina and many people think of a cabin in the woods where they can enjoy the four seasons in a quiet natural setting. This cabin for sale near Brevard, North Carolina is all that and more. Newly built with loads of charm and character on 2.5+ acres. Rustic but sophisticated, this home in the woods is easy to love with special touches like native laurel wood railings, spruce floors, and vaulted ceilings. Everything for every day living is on the main floor. But when company comes, and you know they will, there is an extra bedroom, bath and living area below. Or you can utilize the loft for even more sleeping and play area. For fishermen and women, it just can’t get much better! This home is less than 3 minutes away from the East Fork river and some of the best flying fishing in the southeast. And if you like to tinker in the yard, you’ll appreciate the beautiful landscaping with hundreds of perennials and native plants. 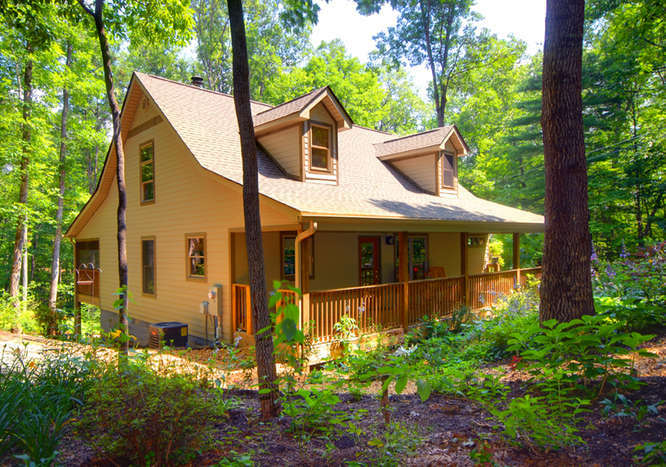 If you would like more information about this cabin in the woods, or other properties for sale in the Brevard, North Carolina area, call the call the Clay Team at 828-551-6290 or 828-551-6291. You can visit us anytime online at BrevardNCProperty.com. Sometimes, you just want to get away. Right? Maybe it’s for a change of scenery or maybe it’s to escape the summer heat in a relaxed setting where you can play some golf. If this sounds like you, this is an opportunity you don’t want to miss. This light, bright, and furnished 2 bedroom 2 bath condo is in Burlingame at Sapphire Lakes, an upscale but comfortable country club community that’s located in the mountains of western North Carolina between Brevard and Cashiers. The main floor of the condo includes a huge master suite, spacious kitchen, open living room with a cozy fireplace, and a large screened porch as well as an open deck where you can kick back and listen to the sounds of the Horsepasture River. Downstairs is another bedroom, full bath, and private deck for your visitors. Best of all, the only long drive you’ll be making is on the fairway! Just step out your front door and the country club and all the amenities are just a short walk away. When you live in Burlingame, whether it’s year round or seasonally, there’s plenty to do! Between the world class golf, the tennis, working out in the state of the art fitness center, relaxing by pool, or participating in the varied social groups, you can stay as busy as you choose to be. At the end of the day, if cooking isn’t on your mind, you can enjoy the fine dining in the club house or just grab a burger at the grill. It’s a great lifestyle and a warm welcoming community where you’ll feel right at home. For more information about this condo for sale, or other property for sale in the Cashiers or Brevard area, call the Clay Team at 828-551-6290 or 828-551-6291. Visit us online any time at BrevardNCProperty.com. Glen Cannon Country Club is one of the most popular golf course communities in Brevard, NC and a great choice for year round or seasonal living. The gently rolling terrain, wooded landscape, and the flowing creeks and waterfalls combine to create a beautiful backdrop for this mountain community. Plus, it is only a short five minute drive from downtown Brevard and approximately 25 minutes from the Asheville Regional Airport. This home for sale at 183 Argyll Circle in Glen Cannon offers you “end of the road” privacy in a quiet wooded setting with mountain views. The main floor features a spacious kitchen and family room that open to the new deck where you can enjoy the mountain view. There’s also a formal living room with a cozy fireplace. The master suite along with two more bedrooms are all located on the main floor for convenient, one level living. Below you’ll find a large workshop and an additional space that could be finished out for a variety of uses. One reason many people choose to live in Glen Cannon is the golf course. 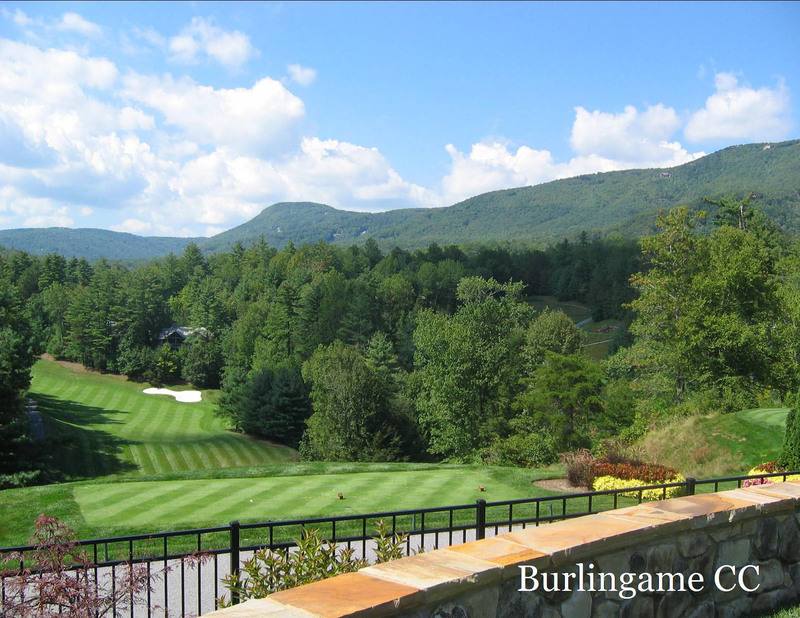 The 6,548 yard, par 72 course is one of the finest in western North Carolina and is maintained for year round play. Hole #2, the signature hole, features a naturally cascading waterfall that feeds into a crystal clear mountain stream that weaves it’s way throughout the golf course. No matter what your handicap may be, you’ll find four sets of tees to accommodate and challenge every level of play. You’ll also find Glen Cannon is well suited for those who enjoy a round of golf by walking the course. Glen Cannon Country Club also serves up plenty of action on their five tennis courts. Two hard surface courts are open year round and three Har-Tru clay courts are available April through October. Two of the clay courts are also lit for night play. In the summer months, relax at the oversized swimming pool with its two deep-water pods, large recreational area for laps, and shallow kiddie area for the little ones. For more information on property or other homes for sale in Brevard, NC, contact the Clay Team at 828-551-6290 or 828-551-6291. Or visit online at www.BrevardNCProperty.com. Discover for yourself why it’s good to have friends in the mountains.